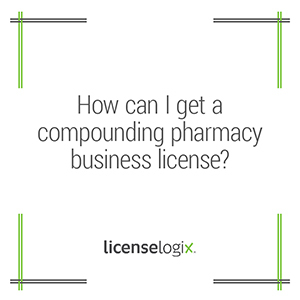 How can I get a compounding pharmacy business license? Generally, the licensing process for a compounding pharmacy is different from a standard pharmacy. Compounding pharmacies are often governed by state regulations specific to compounders. The level of record keeping and due diligence often surpasses the standards required for non-compounders. Some states require additional attachments and forms for compounding pharmacies applying for the state pharmacy license. Other states have separate and distinct licenses required only for compounders. The regulatory landscape for compounders is changing rapidly and we expect many states will enact new licensing requirements over the next few years. In many states compounding pharmacies need the same licenses as a regular retail pharmacy. These licenses are often called a resident pharmacy license for in state pharmacies or a non-resident or mail order pharmacy license for out of state pharmacies. The application process is similar to non-compounding pharmacies in most cases. Applications usually require sample labels, DEA Registration, inspection reports, and corporate documents. Compounding pharmacies must often provide supplemental information and attachments with each application. These can include internal policies and procedures of compounding practices, more stringent inspections, and proof of accreditation. Some states have a separate license specifically for compounders. The California Board of Pharmacy, for example, requires in state pharmacies either obtain the sterile compounding license or hold current accreditation from through an enumerated list of private accreditation agencies. CA requires that non-resident pharmacies hold the non-resident pharmacy license AND the sterile compounding license AND a current accreditation. Effective September 2013, the Florida Board of Pharmacy now requires a special sterile compounding permit for resident pharmacies, in addition to the resident community pharmacy license. Sterile compounders have until March, 2014 to obtain the license. This license is not required for non-resident pharmacies at this time. Other states, including Maryland, have proposed legislation that would require separate licenses for compounders. LicenseLogix will help guide compounding pharmacies through the changing landscape of licensing requirements and regulations. We can help you obtain all of the licenses and registrations you need, minimizing time-consuming and costly delays. If you are already licensed, we can file renewals and manage ongoing compliance. For additional help you can fill in the form on the right or give us a call at (800) 292-0909.